We've been celebrating National Volunteer Appreciation Week on Facebook by sharing old stories from the blog about some of our best and hardest-working volunteers. This month, we shared a new story about a volunteer attorney named Tim Fox, who is always committed to going "Above and Beyond" for our clients. We then met a recent employee of the Clinic, Jim Floyd, who started out as a volunteer for the Low Income Taxpayer Clinic. Happy New Year! 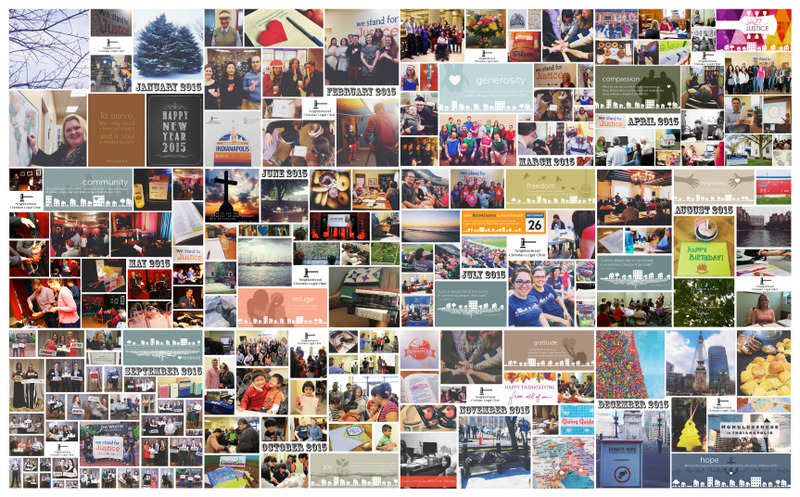 Above is a look back at the Clinic’s photo highlights from 2016–an abundant year filled with abundant life! In partnership with Outreach, Inc., we launched our Homeless Youth Justice Program this year, which allows us to provide free legal services to one of Indianapolis’ most vulnerable, and often-underserved populations. We also expanded our Victim Justice Program thanks to a VOCA grant through the Indiana Criminal Justice Institute, helping us to better meet the great need in our community. March was an extremely busy for the Clinic! We were blessed with the chance to compete in Brackets For Good again, and because of our amazing supporters, we were able to raise nearly $20,000 in just two weeks for free legal services for our low-income neighbors! Additionally, we learned more about the importance of donations and how the Clinic seeks and utilizes these very necessary funds. A pivotal element of HYJP is the Program Manager, Ben Hayes. Unlike the two attorneys who work cases for Outreach’s youth, Ben’s position is more nebulous. His job is to build relationships and to create a bridge between their kids and our attorneys. Most of the youth that go through Outreach know what it’s like to be burned by someone they were supposed to be able to trust—in fact, that is usually an inciting incident to them becoming homeless in the first place. “Every one of them is going to have a different story,” Ben says. The one thing they all have in common though? Trauma. According to a series of internal surveys conducted by Outreach in 2014, 71% of their young woman said they were sexually abused before the age of 18 and 88% of their young men saw their mother beaten before the age of 18. This blog will also go through some exciting changes in the coming year. We will start by honing in on the many different facets of the Lord's Abundance. This January, we're thankful for Abundant Life. Join us next month as we focus on Abundant Love and as we launch our first-ever podcast!